Maker on the Move: Lucie deLaBruere Wants All of Vermont's Students to be Tuned in to Tech | Features | Kids VT - small people, big ideas! It's the Friday afternoon before Art Hop, and the Generator maker space in Burlington's South End is buzzing with the sounds of sawing, clanking and drilling. Another noise joins the mix: the laughter of education technology specialist Lucie deLaBruere, who has been a member here since the Generator opened three years ago. A native of West Charleston in the Northeast Kingdom, deLaBruere, 58, was one of the first in her family to go to college; Her eyes brighten as she recalls instructors who encouraged her to pursue learning. She got a bachelor's degree in secondary education, concentrating in social studies, then went back to school years later to earn a master's of science in internet engineering from Marlboro College. 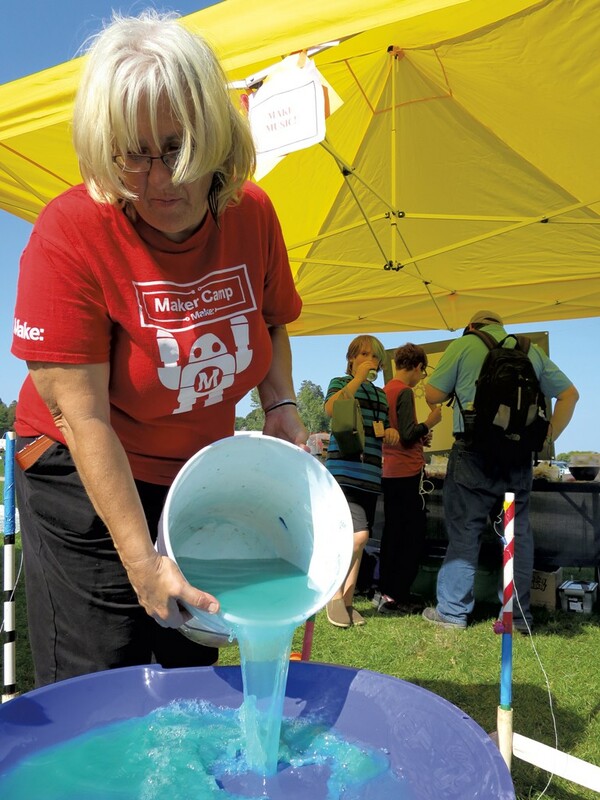 In her 30-some-year career, deLaBruere has led the charge in bringing the maker movement to Vermont students. 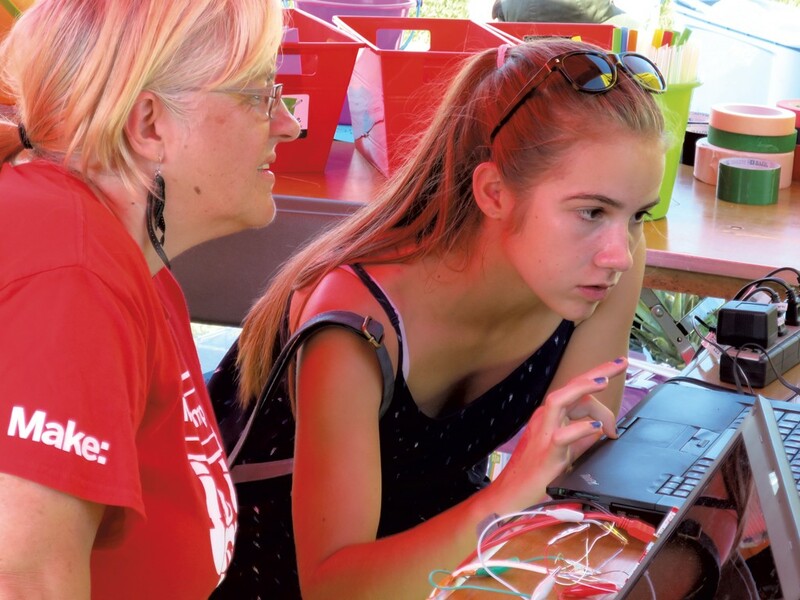 After teaching business, career and technical education, and technology integration in the NEK, she now devotes her time to her blog, Learning With Lucie, where she writes about everything from sewing to coding to working a 3D printer. 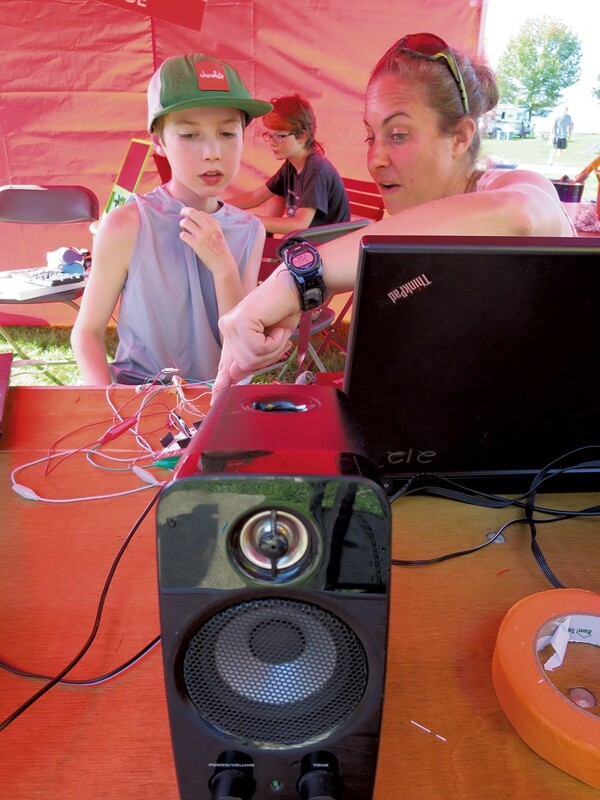 She also logs thousands of miles in EMMA, her van turned mobile maker space, bringing things like power tools, soldering stations and laser cutters to kids in all corners of Vermont (See below). And she leads workshops for educators interested in bringing maker spaces and innovative technology to their schools. Kids VT decided to quiz the teacher about why tech makes her tick. KIDS VT: What inspired you to choose teaching as a lifelong pursuit? LUCIE DELABRUERE: I guess I enjoy learning. Even 30 years into my career, I'll step back and say, 'Why am I doing this?' Yesterday my head was hurting about a laser cutter — not getting it just right. And my husband said, 'Because you like learning, remember?' Yeah, that's why my website is called Learning with Lucie. KVT: What's your earliest memory of technology? LdLB: I asked for a tape recorder for Christmas. I was totally fascinated that this thing that was about this big that had wheels on it would actually tape your voice and play it back to you. That was my big present. I remember hiding it in the back of the couch and putting it on record for when some of my five sisters were around. KVT: And then you went to UVM, and SUNY Oswego, and Marlboro for your masters? LdLB: Yes. I grew up in a family where I was the first generation to go to college — my father offered me a car if I did not go to college, because it was cheaper than the typewriter I wanted. My grandmother would say, "What are you going to do with those grades?" People in general didn't go to college, especially girls. So teachers had a great influence on my life. And college was challenging because of the financial aspect. I funded it all myself. My big treat was Carbur's [Restaurant in Burlington] on Wednesday nights. I'd save up $5, and if I got my homework done I'd get a Dutch mint hot chocolate. KVT: What was it like to return to the Northeast Kingdom to teach? LdLB: When the internet first came to the Northeast Kingdom — that totally changed what it was like to be a teacher. CompuServe had been a long-distance phone call! My kids came back from that summer, and I had a curriculum plan because I had learned how to use the network. There were no IT people, so I had to learn how to fix everything. The kids discovered Linux and put penguin screen savers on all the computers. It was like the Reformation. All of a sudden it totally changed how high kids could reach. And I wanted to keep up with them, which is why I decided to get my master's in internet engineering. 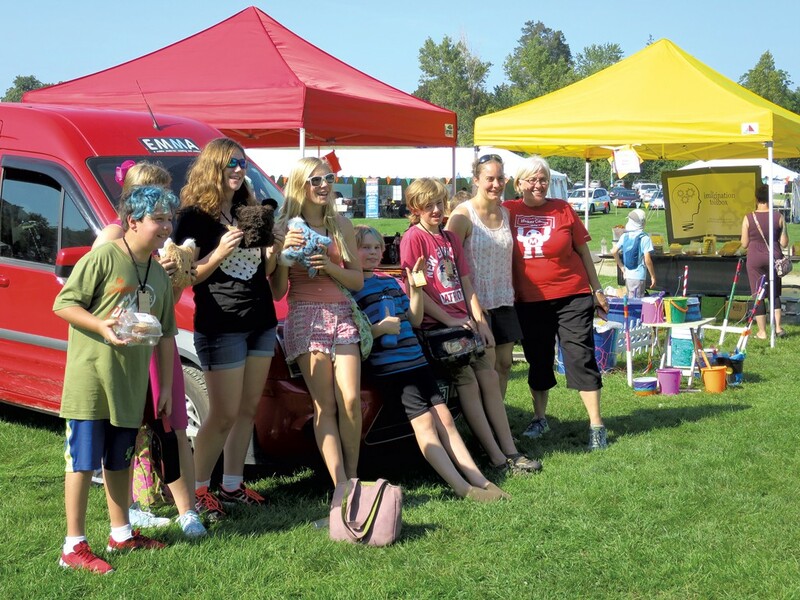 KVT: Why is teaching girls so important to you? LdLB: Well, it increases their income potential. When young women feel confident with their technology skills, they can apply for higher-paying jobs. And we want a world filled with inventions and solutions to problems that work for both men and women. Plus, creating and making with technology is an easy way to build a feeling of empowerment. KVT: Can you share an anecdote of a student who made an impact on you? LdLB: One year, we were in week two of the fall semester when a girl named Heidi approached me after class to tell me that she didn't speak in front of groups, so she couldn't complete part of an assignment. She told me she realized she might get a zero. I respected her choice, but did everything I could to build her confidence. Two years later, Heidi not only had built her own computer as her senior project in my class, but she was also the president of Vermont Future Business Leaders of America, which meant that she spoke in front of hundreds of teens at state conferences. Heidi ended up majoring in outdoor recreation at Castleton, and got her first work-study job in the IT department helping troubleshoot computer problems for other students. She now lives in Alaska, where she has been a field engineer for the Plate Boundary Observatory. KVT: You're still teaching through Learning with Lucie and EMMA, but how did you transition out of the classroom? LdLB: Seven years ago I got married to a man with wanderlust who convinced me to go on the road with him. So I left the house, the family, the job, and we now live out of a bus half the year, and in Colchester on Malletts Bay. We love the travel. KVT: What is one of the biggest challenges for you today? LdLB: Rural doesn't scale. It's hard to drive 90 minutes to these areas. How can I, as a sole practitioner, partner with organizations that are more positioned to have a collective impact? KVT: What keeps you rooted in Vermont? LdLB: I love that we are flexible and nimble, and that we have had personalized learning. The whole state is catching on to what we were doing in the classroom 20 years ago, thanks to Act 77 [which created the 2013 Flexible Pathways Initiative to support the implementation of personalized learning plans]. I was part of a tribe that believed in this, and that's pretty cool stuff. Small classrooms mean that nobody gets lost, and that they have opportunities with technology. My twin boys are now professional musicians in New York City, playing Carnegie Hall, the White House, all over the world, and they went through public school here. This was from Vermont teachers. You can make it happen.